Welcome to our featured EDDM client of the week! 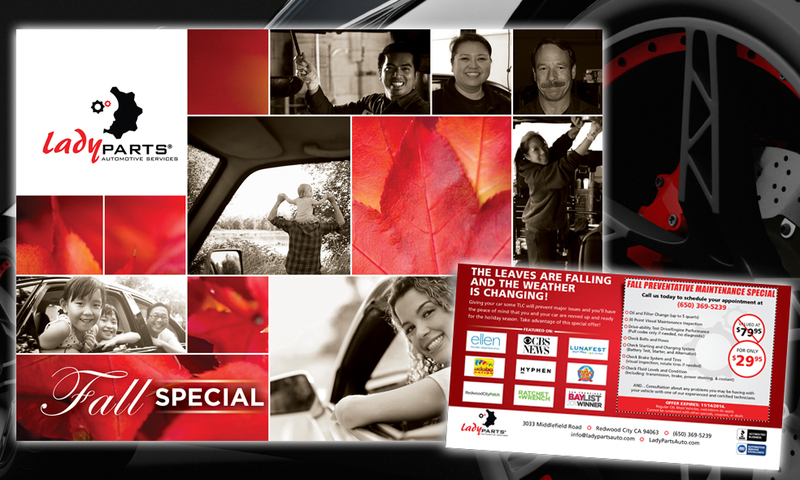 LadyParts Automotive Services first contacted ummhumm | creative studio in September, 2014 to create an EDDM mailer for their feature in the LunaFest Film Festival. LunaFest is a traveling film festival of award-winning short films by, for and about women, which fit perfectly for our new client. 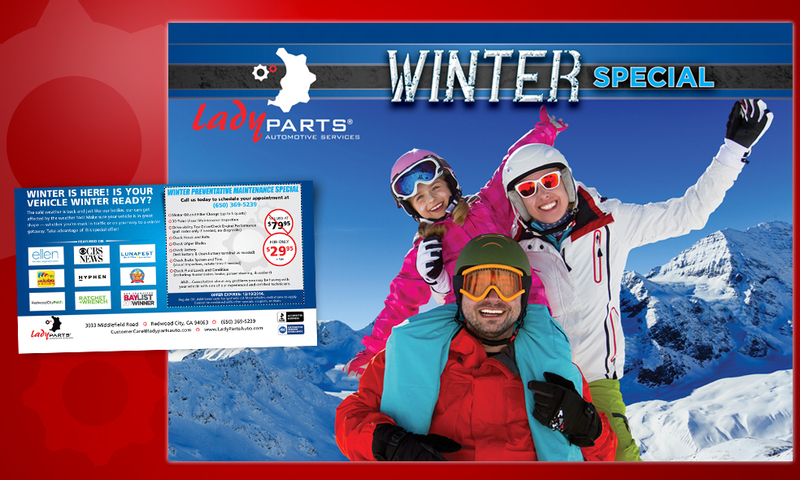 We quickly set upon the design and the reception was so wonderful, LadyParts contracted a Fall and Winter EDDM mailer. Our joy to work with our new client was quickly cut short. In October, the owner and main lady, passed away. We had a wonderful, great experience working with LadyParts and they managed to stay open for a few more months before finally closing their doors in 2015. We wish all of the technicians and support staff all the best. LadyParts Automotive Services embodied a bold vision for providing the best automotive services by addressing customer’s needs and concerns about their cars, acute attention to detail and follow-up, a commitment to customer satisfaction, and most of all – education. The LadyParts Auto team hosts Car Care Clinics aimed at empowering customers with basic but highly important car care skills. Mae de la Calzada founded LadyParts Automotive Services based on a simple observation: “When a woman’s car breaks down, lives break down.” Recognizing the strain of being a wife, mother, professional, and friend all at once, de la Calzada saw a way to ease at least one burden women often face. This vision helped her to turn the intimidating ordeal of auto repair into an empowering experience.Today, when women — or men — walk into LadyParts Automotive Services, they are greeted by automotive technicians who eschew technical jargon and instead speak in the simple, clear language that both cars and drivers instinctively understand. Claiming certifications in hybrid repair, LadyParts’s mechanics work on virtually all makes and models of vehicles, performing services that range from 50-point safety inspections to major repairs. To enhance each visitor’s experience, the staff coordinates free shuttle service and furnishes a waiting area with free wireless Internet access, a 50-inch plasma-screen television, and well-maintained restrooms. To further demonstrate its goal of turning auto repair into an empowering experience, LadyParts’s team leads car-care clinics in which technicians demystify automobile maintenance. Such efforts have earned LadyParts Automotive Services consistent press, a vast network of loyal cars ready to do its bidding, and recognition that includes a 2011 Best Car Repair win from ABC7 The Bay Area A List, as well as a top-five finish in the 2012 race.